Short Sales vs. Bank Owned? My, what a difference a year makes. In late 2008 lenders, as well as industry giants Fannie Mae and Freddie Mac dominated both the active listings and sales statistics with their foreclosure inventory. Rumors abounded about an additional looming â€œshadow inventoryâ€ of foreclosures which would further destroy our already decimated marketplace. The oncoming â€œforeclosure tsunamiâ€ was spoken of as a certainty. Fast forward to 2010 and one is met with a very different scenario than predicted. Thanks to the in-depth research done by Mike Orr at the Cromford Report we know all those industry â€œvisionariesâ€ were mistaken. In reality, the foreclosure (REO) market appears to have peaked in the first half of 2009. Since then the tide has steadily continued to turn from a foreclosure dominated market to a short sale market. Why? Lenders have finally determined that an effective short sale process usually reduces their investor’s losses compared with foreclosure. In fact, one bankâ€™s study showed an average savings of $38,000 on a short sale vs. a foreclosure. Additionally, new government incentives are now in place for lenders which reward short sales over trustee sales. For these and other reasons, many lenders are refining their short sale processes and making faster and better decisions. Buyers have increased their willingness to buy short sales. Benefits to buyers include the reduced competition for short sales vs. REOs â€“ as well as the ability to purchase with financing instead of the cash which REOs so often demand. Despite the patience required to wait out the months long short sale process, buyers can obtain homes generally in far superior condition to REOs and usually within 1-2% of the cost of an REO. In short, buyers have wisened to the value proposition short sales offer. Sellers. A large proportion of homes in the valley have negative equity as most sellers either purchased after 2002 or have refinanced. Owners wishing to sell in this circumstance either need to bring extra money to the close of escrow or must attempt a short sale. The latter option is by far the most popular with sellers for obvious reasons. Therefore, short sales comprise an increasing share of the active listings while lender-owned homes are on a downward trend. While the total number of active listings has fallen by 23% since January 2009, the number of short sales offered for sale has grown by 50%. Sellers have finally accepted that a short saleâ€™s impact on credit ratings will usually be less than in a foreclosure. Additionally a new government program released on April 5th HAFA (Housing Made Affordable Foreclosure Alternatives) offers qualifying sellers cash incentives of up to $3000 to participate in a short sale. We can see that short sale listings are most dominant in certain low to medium priced areas with a high proportion of new homes – particularly in the west valley. They are least prevalent in high priced areas and in those targeted at the over-55 market, where normal sales are still the majority. 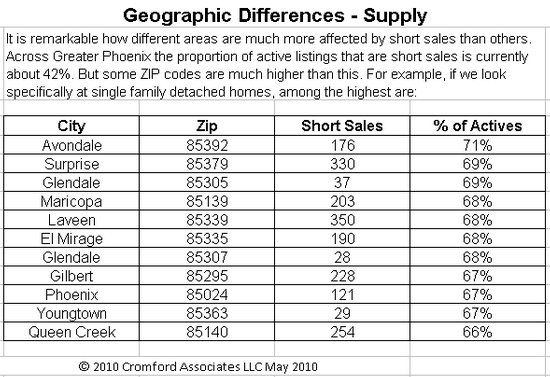 It is not the outlying location that is important, since we see that Rio Verde, Gold Canyon and Wickenburg are all near the bottom of the short sale league. It is not necessarily the cheapest areas either, since some of the lowest priced areas of the valley, such as parts of west and south Phoenix, show pretty ordinary rates of short sale listings (e.g. 85009 -34%, 85033 -39%). Homes in these areas are more likely to be foreclosed without an attempt at a short sale. The end of the REO market is certainly not here yet but in the last few months we have seen a significant drop in the flow of new Notices of Trustee Sales suggesting that REO inventory will fall back to more normal levels over the next two to three years. However the situation that creates short sales (negative equity will not be a quick fix. It seems very unlikely that Phoenix real estate will more than double in price anytime soon, which it would have to do to match the peak price levels seen in mid 2006 and eliminate all the negative equity created by the subsequent collapse. It also seems unlikely that sellers bringing cash to the closing table is going to ever become a popular option. So for now, and for the foreseeable future, short sales are here to stay. Thanks to Mike Orr for what is really the heart and soul of this article.